Taking your bike with you on a vacation or trip in your RV adds to the fun, allows you to see more of the surrounding area and it is a great way to get some exercise. 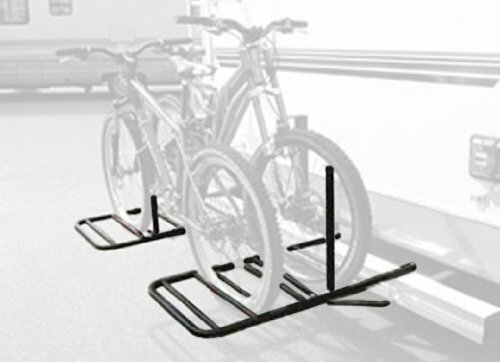 Carrying or storing your bike on your RV can be done using a bike rack. 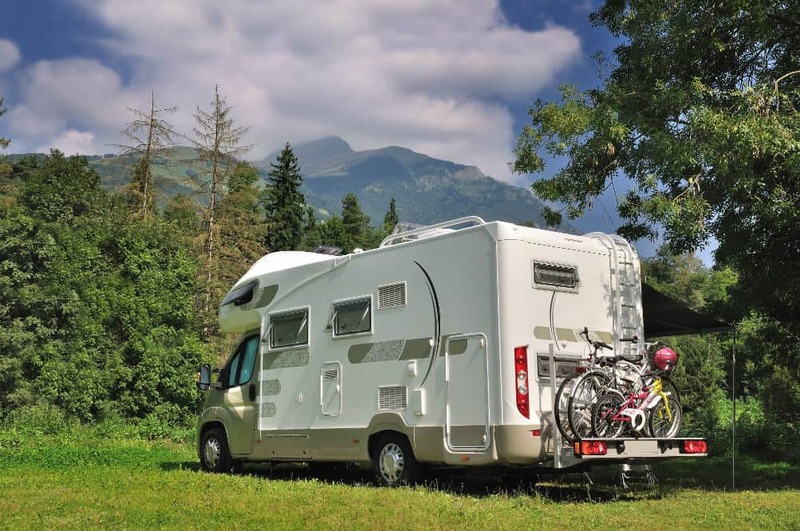 Assuming you have a strong lock, it keeps your bike secure, prevents your bike from getting damaged, and it frees up other space, especially inside your RV, which may have been the only alternative place to store your cycle safely. These are normally attached to motorhomes with a strong steel rear bumper. Because of how strong the bumper is, it is often possible to store more than bike to these racks. This type of rack, as the name suggests, is connected to the rear ladder of an RV which has them. Bikes are stored vertically and it can normally accommodate 2 bikes. For RVs, and in particular, motorhomes which have a trailer hitch to them, these bike racks are ideal. The bike is attached to the hitch and they can carry as many 4 bikes at a time, so perfect if the whole family plan to go cycling. This bike rack is suitable for both hitch and bumper connection as it has a bumper adaptor included. It will connect to a continuous 4.5 inch welded steel RV bumper and can carry up to 2 bikes for a combined maximum weight of 70 lbs. To ensure the bikes are held in place the rack has adjustable hooks, and push-button ratchet arms can adjust in order to secure the bikes. 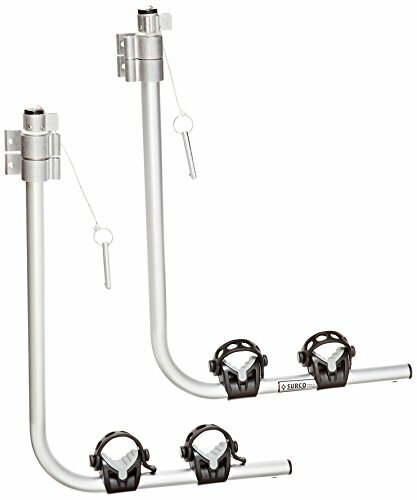 This RV bumper bicycle rack from Swagman is designed for use with RVs which have 4 inch to 4.5 inch square rear bumpers. The rack is secured using 4 U-shaped bolts and locking nuts. 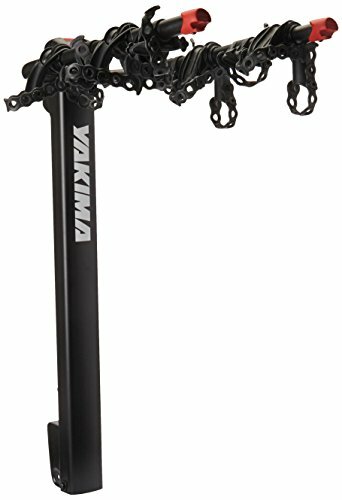 A vertical bar at the center of the rack allows you to secure your bike with a cycle lock or padlock and chain. The rack is black in color and it is coated with a rust resistive coating to help prevent corrosion. It has the capacity to carry 2 bikes with a maximum weight per bike of 30 lbs. Having looked at a few products, this is the best RV bumper rack we have found. One the main reasons is that while the others can carry two bikes, this one allows you to carry up to four. It secures to any 4 inch to 4.5 inch square bumper using U-bolts and can carry a maximum combined weight of 120 lbs. 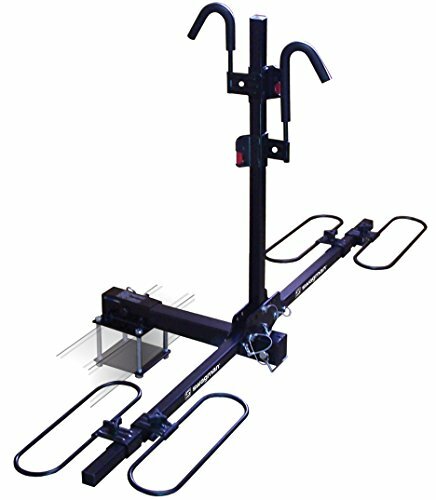 An upright bar at the center of rack gives you the means to securely attach all the bikes either individually or with a chain which interlocks them all. Weigh capacity of 120 lbs. 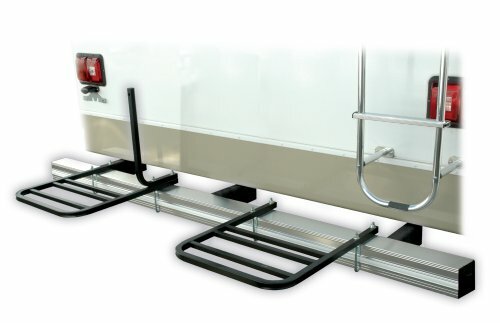 This rack can be installed on most RV ladder mounts quickly and easily. It hooks on to one of the upper rungs and is secured at the bottom using rubber straps. Rubber straps are also used when securing your bikes. This ladder rack can hold two bikes at a time with each bike weighing up to 35 lbs. To protect the bikes from scratching there are cushioned rolls on each side rail. The rack is made from aluminum which means it’s not susceptible to rust. There are reflective stickers on each arm which improves safety when driving at night. If you like simplicity, then this RV ladder rack will appeal to you. It can be fitted to most RV ladders without the need for straps nor the ladder itself having to be unmounted. 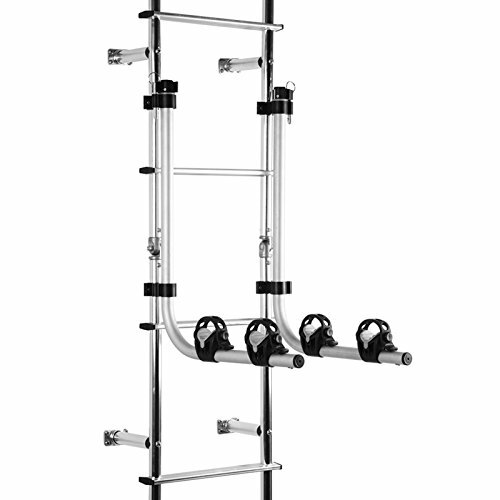 The rack has mounting connectors which fit it securely to the ladder. The rack can carry one or two bikes and when the bikes are on the rack they are protected thanks to padding on the cradles. When not in use the arms pivot so that they are not protruding or preventing access to the ladder. 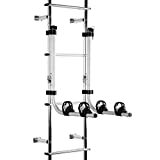 With an aluminum construction, this ladder bike rack is both strong and durable, plus it will not rust. 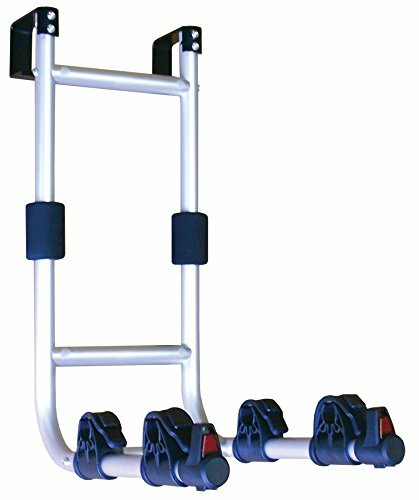 It is suitable for ladders with 1-inch rails and is attached using connectors and pins which are designed not to rattle when your RV is on the road. When you need to access the ladder simply remove the pin. Bikes are held securely by adjustable straps. The capacity of the rack is 2 bikes with a recommended weight maximum of 50 lbs. in total. 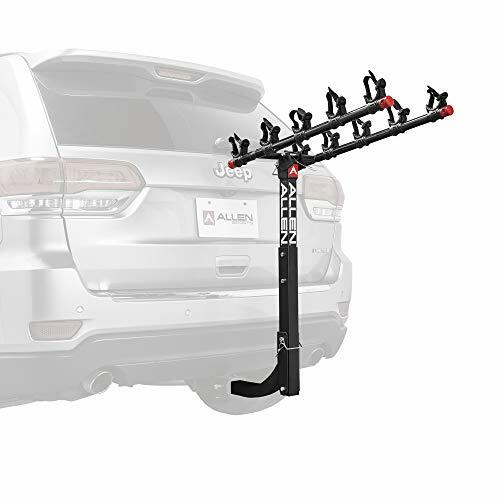 The hitch bike rack will easily carry two bikes with a maximum load of 35 lbs. per bike. The ratchet arms are adjustable for different bike sizes and can accommodate bike frames up to 23 inches. Center arm can fold down when you need access to the rear of your RV. The grips which secure the bike have a special coating which protects the bike’s frame from getting marked. It is suitable for hitch receivers between 1.25 and 2 inches, and when fitted it has anti-wobble mechanism which prevents excess movement when your vehicle is in motion. Easy to install within a few minutes and is made from coated steel so it has a sturdy construction. Its capacity is 5 bikes which are all secured using adjustable straps. When it’s not being used the arms fold away and the rack can be tilted so that you can gain access to the rear of your RV. Fits 2-inch trailer hitches only so check the specification of your vehicle before purchasing. This hitch rack is suitable for both 1.25 and 2 inch hitch receivers. When not in use it can be folded with by pressing a release trigger to give you unrestricted access to the rear of your vehicle. You can use the rack to carry up to 4 bikes with a maximum bike weight of 40 lbs. each. Each bike is held securely in an anti-sway cradle which prevents bikes from banging into each other whilst you’re travelling. How many bikes do you want to carry? The answer will determine the size of rack you need. Check the maximum load the rack can carry. If you use the rear of your vehicle regularly, ensure the rack can tilt or fold to allow access. Some require a couple of bolts to be secured, others are a bit more complicated. Check so you are prepared. Will protect the rack and bikes when travelling in adverse weather. This fits between the handle bars and the seat and to allow bikes with unusual frames sizes to be secured to a bike rack.